On June 6 (Sat. 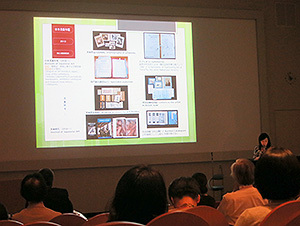 ), the “Advancement of Art Resources in a Global Context – Contact point between global digitalization strategies and academic specialized research” was held at the National Museum of Western Art in Tokyo as part of the annual meeting of the Japan Art Documentation Society. Representing the National Research Institute for Cultural Properties, Deputy Director General Atsushi Tanaka and Mai Sarai, senior researcher at the Department of Art Research, Archives and Information Systems, attended the symposium as presenters. With an eye to increasing the quantity of art resource information, which has been internationally requested, this symposium was intended to confirm the situations surrounding relevant organizations regarding issues related to the specialization and advancement of information in Japan and to deepen discussions on the issues. 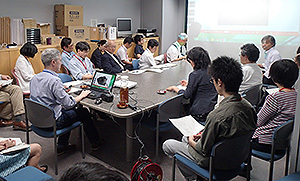 First, representatives from the National Museum of Western Art, the Netherlands Institute for Art History (RKD) and the National Research Institute for Cultural Properties, Tokyo, respectively gave presentations on their own methods of offering information on art and cultural properties. Mr. Tanaka and Ms. Sarai from the institute gave a presentation under the title “Formulation of Specialized Archives on Cultural Property Information – Efforts by the National Research Institute for Cultural Properties, Tokyo,” and introduced the history of the institute, archives activities and digital contents, and reported the institute’s efforts and measures on the provision of information at a global level (cooperation with the Sainsbury Institute for the Study of Japanese Arts and Cultures and with the Getty Research Institute, etc). Following the individual presentations, a panel discussion between presenters and a keynote speech by Akiko Mabuchi, the director general of the National Museum of Western Arts, were held in the symposium. In this symposium, we again presented the effectiveness of art and cultural property information and resources that have been accumulated and maintained by the institute over many years in research activities under the current situation surrounding art resource information to relevant officials at home and abroad. At the same time, we could obtain many suggestions on the provision and dissemination of information at a global level by learning pioneering activities of other institutions. The dialogue event was the second phase of the symposium. Emiko Yamanashi and Mai Sarai from the department asked Ms. Ikemura questions and she gave answers to the questions. 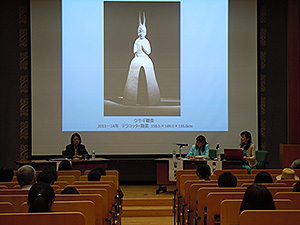 In the trilateral dialogue, Ikemura delivered various talks, starting with the production concept of her most recent work “Usagi Kannon,” a terracotta statue more than three meters in height. Then she talked about practical issues including production techniques, materials, the selection of media, and ways to realize production concepts. In addition, she frankly and fully discussed the act of creation, such as her attitude toward production, inner feelings and conflicted feelings at the time of creation, and the state of mind she is trying to reach through art. When she draws a picture, Ikemura said, “I capture the moment when the object and I are integrated. What I want to draw is not an object. I want to capture the sense that the object is connected to me and my body. That is the connection between myself and the world and experience, and I am trying to make it into a painting.” That statement was very impressive. The contents of the dialogue will be made available on the website of the National Research Institute for Cultural Properties, Tokyo. We hope you will look forward to this. On June 16 and 17, Atsushi Tanaka, deputy director general of the National Research Institute for Cultural Properties, Tokyo (Tobunken), and Mai Sarai at the Department of Art Research, Archives and Information Systems visited the Getty Research Institute (GRI) that plays a leading role globally in the dissemination of information on artworks and art research with the help of Ms. Ann Adachi, a video art researcher living in Philadelphia. They had a consultation with officials at the GRI to seek the possibility of joint research. In October 2014, GRI Director Thomas W. Gaehtgens and other staff members inspected Tobunken. Following the visit, both institutions decided to hold a consultation to seek concrete ways of cooperation. 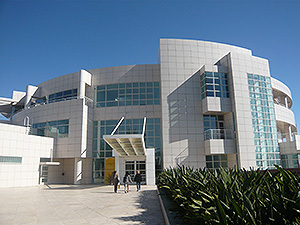 The GRI is located on a hill overlooking the coast in Santa Monica in Los Angeles and the UCLA campus. 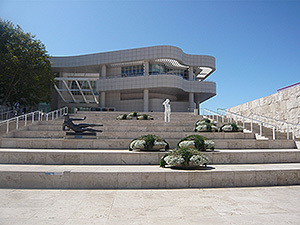 The GRI is part of a complex facility generally referred to as the Getty Center that comprises such institutions as the Getty Conservation Institute and the J. Paul Getty Museum having five pavilions. Jean Paul Getty, the founder of the Getty Center, had an idea that the revolutionary digital technology in the 21st century would enable the integration of art, humane studies and natural science, and that the Getty Center should offer a platform for the integration. Based on the idea, the GRI has been organically organizing a range of projects in cooperation with museums and research institutes not only in the United States but also in Europe, aiming to form a cooperative model to integrate accesses to all artworks. Sarai gave a presentation titled “Approaches to the Creation of Japanese Cultural Properties Database at the National Research Institute for Cultural Properties, Tokyo; Tobunken,” and introduced Tobunken’s current efforts to disseminate research information on cultural properties to Mr. Gaehtgens and other senior officials at the respective departments. 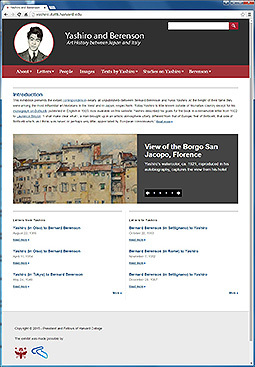 Tobunken’s digital archives on cultural properties and artist database are contents that are highly likely to be linked to the Getty Center, and we received favorable reviews from staffers at the GRI. We will reach an agreement to promote cooperation between both institutions and eventually exchange memorandums. 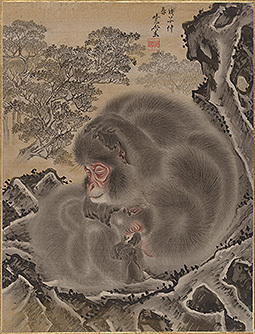 If Tobunken’s digital contents could be searched on the GRI’s portal site, which is connected to the world, information on Japanese art and cultural properties will certainly become available to a larger number of people in the world. We will continue to enhance Tobunken’s ability to disseminate information. 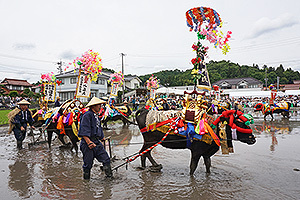 Since 2011, the Department of Intangible Cultural Heritage has been conducting the second Research Exchange between Japan and South Korea in relation to the Safeguarding and Preservation of Intangible Cultural Heritage with South Korea’s Intangible Cultural Heritage Center (the former National Research Institute of Cultural Heritage). As part of the program, Mr. Ban So Young of the center visited Japan from June 1 to 22 and conducted a joint survey. 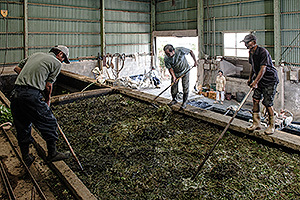 Aiming to conduct concrete case studies on activities of conservation groups and others for the safeguarding and utilization of intangible cultural heritages, we inspected Mibu no Hana Taue, the ritual of transplanting rice in the Mibu area of Kitahiroshima town in Hiroshima Prefecture, (designated as a national important intangible folk cultural property and inscribed on UNESCO’s Representative List of the Intangible Cultural Heritage of Humanity) and Miyoshi no Ukai, a traditional fishing method using a cormorant conducted in Miyoshi, the same prefecture, (designated as a Hiroshima prefectural intangible folk cultural property), and interviewed the people concerned. 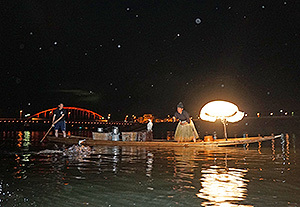 For their transmission to later generations, both Hana Taue and Ukai are indivisibly connected to tourism. 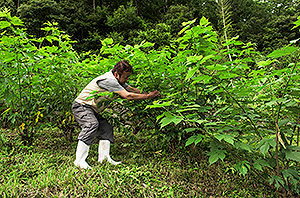 Especially because of that, not only successors but also a wide range of actors such as local governments, related organizations, people in relevant communities, researchers and audience are interrelated in various ways for the transmission of the intangible folk cultural assets, and these assets have been passed down to later generations in more flexible ways while having relations with local economies. In the latest survey, we could learn a part of the actual situations. In South Korea, a new law concerning intangible cultural heritages will be implemented in March 2016, which will greatly change the environment surrounding the conservation of intangible cultural heritages in the country. At the same time, this research exchange program will end in this fiscal year, and we will summarize the program in the next fiscal year. In the future, we will compile the results of the second research exchange, while both countries plan to discuss ways of bilateral exchange in the year after next and beyond with moves after the revision of the law in South Korea in mind. Photographing from a high altitude by remote shutter operation using a digital camera’s Wifi function and iPad. Among the monuments of Angkor, many of which have been restored by various methods thanks to international cooperation, Ta Nei temple has never undergone full-scale restoration in the past and quietly remains unchanged as it was in a dense forest. 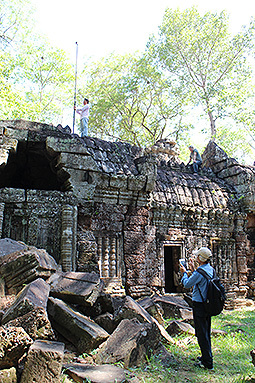 In order to ensure an adequate conservation of the monument while also paying attention to the aspect of utilizing it for tourism without undermining its value, the National Research Institute for Cultural Properties, Tokyo, continues to provide technical assistance to APSARA (Authority for the Protection and Management of Angkor and the Region of Siem Reap) to draft a plan for the conservation and management project. As for the three-dimensional photographic measurement at the remains using SfM (Structure from Motion), which began last year, we have been testing it to establish a method to keep records of the remains’ current conditions, which can be implemented by local staff members as cheap and easy as possible. In this mission conducted from May 27 to June 2, we photographed the remains in the inner side of the inside gallery and implemented the total station measurement of orientation points together with staff from APSARA. Next, we created a three-dimensional model of the ruin covering the inner side of the inside gallery by processing the obtained data using open-sourced software programs (Visual_SfM、SfM georef、Meshlab). While we are currently examining the accuracy of the model, if the method is established, it is expected to be applied not only to other monuments of Angkor but also to ones in other developing countries as a recording method that does not require special equipment or budgets. Meanwhile, the outline and progress situation of the project were reported at the 24th technical session of the International Coordinating Committee for the Safeguarding and Development of the Historic Site of Angkor held on June 4 and 5 at the APSARA headquarters office. The collection of basic data including those necessary to create the model of the entire site will be completed within this fiscal year. As part of the Japan International Cooperation Agency’s (JICA)’ Project for cooperation with the Conservation Centre of the Grand Egyptian Museum (GEM-CC), a training course on “Japanese Paper for Conservation Treatment (Fourth term)” was conducted for two staff members who are in charge of organic conservation of paper such as papyrus in the GEM-CC from the 8th to 17th June. 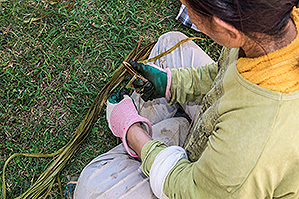 This training course is the last one of a series of four that we have held to apply the traditional Japanese conservation technique called “SOKO” to the conservation of papyrus. 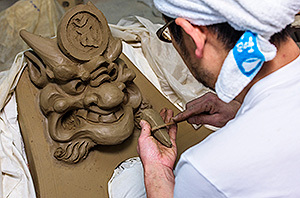 Trainees learned the outlines of Japanese conservation of cultural property as well as the basic SOKO technique such as lining in the NRICPT and conservation ateliers in Kyoto for eight weeks. In addition, we gave lectures and held practice sessions on methods of dyeing Japanese paper with natural dyes, as per requested. Having such a keen interest displayed through their diligent asking of questions and discussions with instructors indicated that they had learned much from the training. 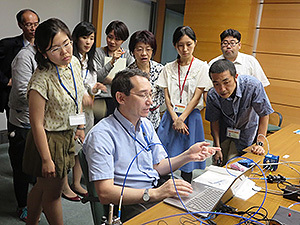 They learned a method for constructing various physical property tests such as “Determination of tensile properties” and “Determination of stiffness” by using papyrus samples in this session. They also developed an understanding of data collecting and sorting, and how to analyze it. This project seeks to foster and enhance cooperation among staff of the GEM-CC so that what is taught in training courses can spread and raise the standard as a whole. This is achieved by having trainees describe and teach what they have experienced and learned to their colleagues. They will design an action plan to apply the knowledge obtained to actual daily work after the roll out. This project is intended to contribute to enhancing the conservation management system of historical buildingscomprising Myanmar’s Bagan monuments, and provides technical assistance aiming for updating the monument inventory and establishing a method to assess the conservation state of structures. At the same time, the project is also aiming for contributing to the human resources development for the Department of Archeology and National Museum (DoA) of Myanmar’s Ministry of Culture, which is in charge of the conservation and management of the monuments. We have been working on the two-year project since 2014. Commissioned by UNESCO, the National Research Institute for Cultural Properties, Tokyo, has been taking part in the project, mainly the assessment of conservation states of architectural structures. So far, we have been putting our efforts into drawing up a rapid condition assessment sheet to effectively understand in a short time the overall conservation states of all buildings in Bagan built during the Bagan Dynasty period. As a next step, we started a study on methodology for an in-depth condition assessment of structural problems that are detected by a rapid assessment. 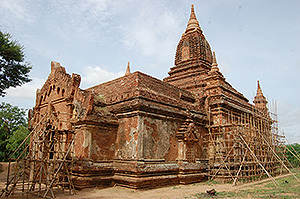 Even among the monuments in Bagan, individual historical architectures differ significantly not only in their scales and structures, but also in locations and damage conditions. Thus, it is difficult to standardize the process of the in-depth condition assessment as we did for the rapid condition assessment, while it is considered possible to develop a certain pattern for detecting basic problems and creating a work flow. So, we decided to select the Phya-sa-shwe-gu temple (No. 1249) as it is an architecture with a typical scale and structure that has not undergone a full-scale restoration so far, and conduct a pilot case study for an in-depth condition assessment at the temple. 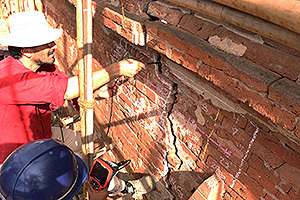 In a field study from June 11 to 19, we conducted detailed recording of crack distribution, non-destructive tests using a Schmidt hammer and an ultrasonic gauging device, a study on the inside of walls using micro drilling and an endoscope, and an excavation surveyto investigate the foundation structure together with an Italian expert in structural engineering, Myanmar engineers and staff members of DoA. On the last day, we discussed about an indoor strength test on brick samples taken from the temple at a research institution in Yangon. The temple building’s structural degradation has been significantly progressing, and the outer wall of the back of the corridor is in a particularly dangerous condition. Through analysis of information and data obtained in the latest survey, we will examine the cause and mechanism of damage and continue the study aiming for presenting an appropriate diagnosis flow.